From the day it arrived off the south end of Garden of the Gods, Rudy’s BBQ has been a popular place to grab a bite. Situated just off of Highway 24 and 31st Street, Rudy’s boasts great ambiance, a large dining room, sports on tv, a country store, a gas station, a patio, and excellent BBQ. I often like to go hiking and running at Red Rock Canyon Open Space which has a trailhead right across the street from Rudy’s. Hopping back on the motorcycle and riding home through the BBQ smells always entices. The only negative to Rudy’s is the weekend crowds (notice the line out the door in the photo). 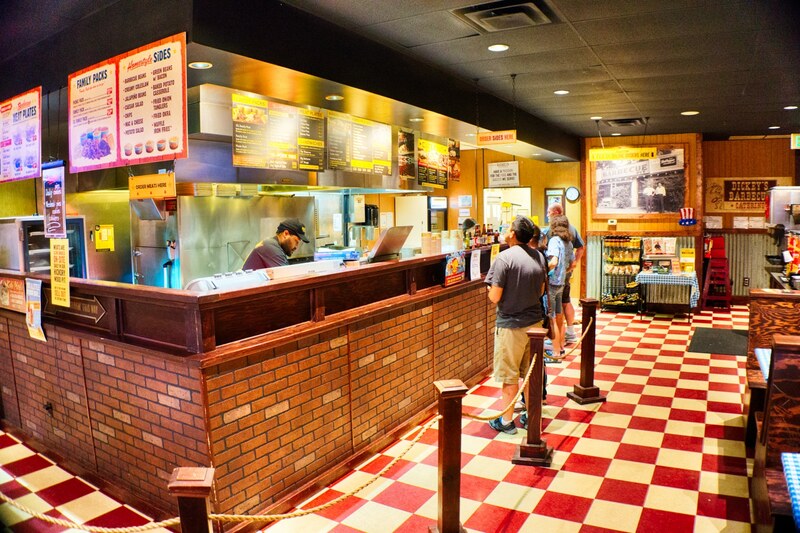 If you are in a rush, consider Dickey’s or Bird Dog BBQ. Many locals know Bird Dog BBQ runs a popular location on the north end of Colorado Springs at the Promenade shopping center. What many people don’t know is about the Bird Dog location off of Centennial Boulevard, near the Albertson’s area at Garden of the Gods Road. This quiet location is 5 or 10 minutes driving from the main GoG visitor’s center. Find out why Bird Dog has one numerous local awards for its “Oklahoma-style” offerings. Head to Bird Dog and you are nearly assured a short wait for great food. BBQ experts may like to debate, but my family especially enjoys Dickey’s BBQ off Garden of the Gods Road (they have the best sides). Kids eat free on Sundays at Dickey’s, and there is free soft serve ice cream everyday for all – score! Dickey’s is another option with fast service and shorter waits. Plus, Trinity Brewing is only a few doors down if you’d like to sample one of Colorado Springs more popular breweries. Front Range BBQ has a funky vibe, and a good reputation for food, drink, and even live music. As Front Range puts it (with unusual capitalization): We’re your Local Smokehouse specializing in Home-Cooked Southern Style BBQ & Cajun Dishes, All Natural Burgers, and the Finest Selection of Micro-Brews. We combine our friendly Southern Hospitality and Food along with some of the Best Original Live Music in Colorado! We welcome you to our house where we Love Good Food, Good Music, Good Beer, and Good Times with our Friends & Family! If you try one of these Colorado Springs BBQ restaurants, be sure to tell them gardenofthegodscolorado.com sent you!